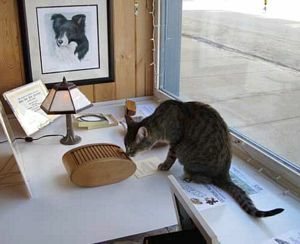 Lenny, who lives in a glass studio in Mineral Point, WI, reaches far to raise awarness for the Iowa County Humane Society's Auction on March 27, 2010. I couldn't resist his request for this donation, an Oval Tambour Jewelry Box. Lenny can be seen, here, giving the box a good sniffing. It is a good thing that the box is finished with a waterborne acrylic coating that won't damage Lenny's sensitive nose. For some, retirement is characterized by lazy afternoons at the golf course and all-inclusive cruises. Former Mount Horeb resident Bruce Erdman, 61, plans on leaving his position as a computer programmer only to reenter the craft that was his livelihood for more than ten years nearly 30 years ago: woodworking. It's been an interest of mine since I was a kid. It didn't really get wild until after I started college," remembers Erdman. A student of environmental studies at the University of Wisconsin-Madison, Erdman says he "needed a severe distraction" from his schoolwork. Woodworking provided a creative outlet that not only distracted him; it led him down a new career path. Erdman credits his engagement to his wife, Kathy, as the inspiration for his first serious furniture project. Seven months before their wedding, Erdman decided to build a headboard and two nightstands as a gift. He purchased air-dried Black Walnut lumber from Green Lake County to create his first masterpieces, furnishings the couple uses to this day. Lacking formal woodworking education but armed with a breadth of knowledge gathered from books and museums, Erdman and his wife moved to Mount Horeb in 1976 and opened a small woodworking shop, Sundog Enterprises. Erdman was not keen on the furniture styles of the time, which were moving in a more contemporary direction. His custom creations were "strictly pre-1800 design content, no modern stuff." Abstaining from more trendy designs allowed Erdman to make his mark in the art world. In 1978, he developed the Oval Tambour jewelry box, which features a roll-top cover that opens into several velvet-lined compartments. Erdman was granted a design patent on his invention on June 16, 1981. "Very quickly after that, we got into the national scene," remembers Erdman. "We literally ended up doing shows everywhere." Erdman displayed his work at high-end craft galleries, primarily on the east coast. The high demand for his products led him to expand his workshop, moving it to 300 West Main Street in Mount Horeb and hiring five employees. 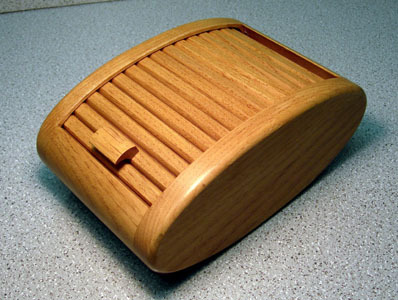 This patented jewelry box is one of several designs that drew Bruce Erdman back to woodworking after a long hiatus. Photo submitted. I look back on it now and I must have been crazy, but we had a really good time doing it." However, it did not take long before Erdman's good time became too commercial for his tastes. "We noticed we had gotten away from the one-of-a-kind to wholesale production, and my heart was not really there anymore." In 1984, Erdman stopped showing his work at galleries, shifting his focus to large furniture. The dawning of the era of personal computers led him to develop a solid oak computer desk, which was picked up by Demco, a furniture and office supply company. Customers mail-ordered Erdman's designs, which were then delivered for home assembly. Nonetheless, Erdman's heart did not stay in his newest business venture either and he ceased woodworking in 1987. "All of a sudden, the woodworking business became more of a business than woodworking. I reached the point where I was no longer able to keep up with the demand," Erdman said. "I decided, 'Nope, I have to do something else for awhile and get my head refocused.' I don't regret that decision, but I do regret not staying with the small items and custom furniture." Life after woodworking was by no means unrewarding for Erdman, who relocated to the Milwaukee area to take an architectural management position. He later went into metalworking and, ultimately, computer programming, a line of work he has remained in for the past ten years. As Erdman retires from the technological fields, he looks forward to returning to the pre-1800 designs of his earlier life. This time, he pledges not to let commercial ventures get in the way of his craftsmanship. "I'm going to concentrate on design, no hired people. I'll basically enjoy what's left doing that." Erdman's return to his roots as a woodworker includes returning to Mount Horeb, not as a resident, but as a participant in the upcoming 37th Annual Art Fair. Despite living there for more than a decade, Erdman will be making his first appearance at the annual event this year. "We never have done the Mount Horeb show, because this time of year we had to be out east doing other shows." After a 20-year hiatus from the craft, Erdman sees the approaching fair as a chance to revive his old passion for woodworking. Coincidentally, Erdman's first appearance at the Art Fair will be marked by the 30th anniversary of his beloved Oval Tambour jewelry box. "It appears the spark has persisted and has returned to save me from a boring retirement time of life". Bruce is still very proud of this honor from Fine Woodworking Magazine. 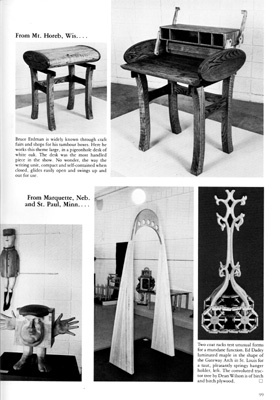 His Oval Tambour Desk was featured on the inside back cover of this issue. 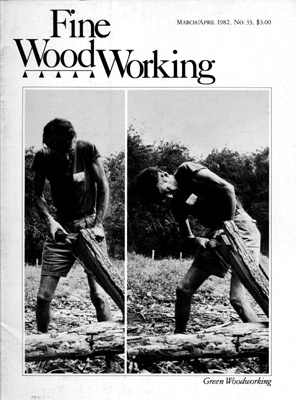 Fine Woodworking, Issue# 33, March-April 1982. 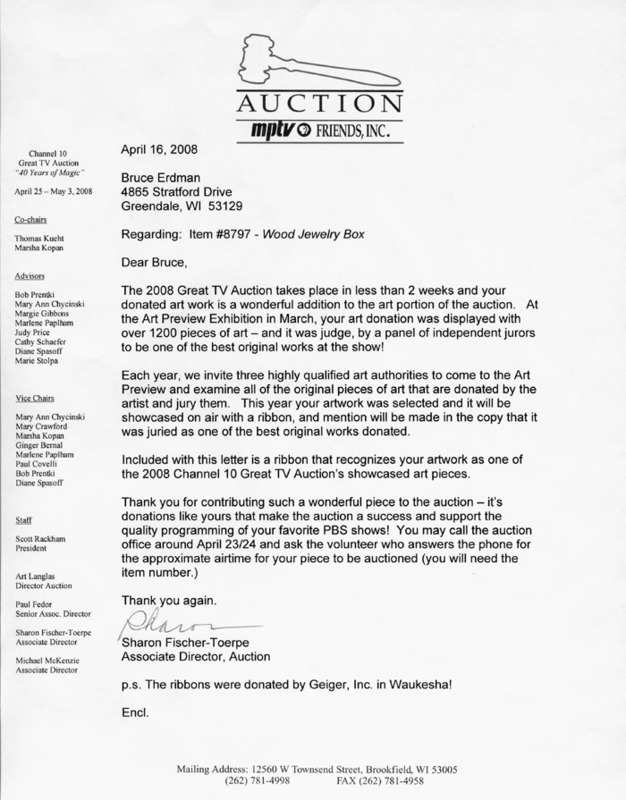 Proud Contributor to The Great Channel 10 On Air Auction 2008. ''This place'' is Memorial Hall in Fairmount Park, built for the Centennial of 1876 and used by the city for special exhibitions. It has a huge rotunda with a glass dome, marble floors and classical statuary - a far cry from temporary tents and drafty hangars. Just 110 artists were chosen this year from 1,000 applicants. Selections were made by a jury that included Joan Mondale, Jean Sutherland Boggs, drector of the Philadelphia Museum of Art, Paul J. Smith, director of the American Craft Museum, and Wendell Castle, the wood artist. The invited craftsmen pay $175 each for a space approximately 10 by 10 feet, plus $7.50 for processing slides used by the jury, but they retain anything made on sales. Guests at the preview party pay $35 each. Visitors to the show are charged admission -$4 for adults, $3 for students, $2 for children and the elderly. Among the other exhibitors are Laurence Seegers, who works in silver jewelry inlaid with ivory or ebony; Shirley Drevich, silver with colorful epoxy resins; David Nelson, porcelain decorative pieces that are stenciled and airbrushed; Alan Stirt, fluted wooden bowls; Bruce Erdman, exotic woods in tambour-lidded boxes; Warren Durbin, sledlike wooden trays and furniture, and Stephen Fabrico, glazed porcelain bowls and jugs. The show is open tomorrow and Saturday from 11 A.M. to 9 P.M. and Sunday from 11 A.M. to 7 P.M. There is free parking around Memorial Hall, plus shuttle buses that run to and from the Convention and Visitors Bureau and the 30th Street railroad station. The Society for Contemporary Craft (formerly The Store for Arts in Craft), 2100 Smallman St. Pittsburgh, PA 15222 | 412.261.7003 |, Cherry Oval Tambour Box.